Give or enjoy our most popular flavors with the Meduri Favorites Sampler Set. 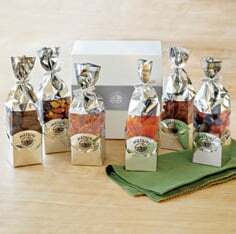 Treat yourself or someone special to the best of our best with six varieties of all-natural dried fruits. 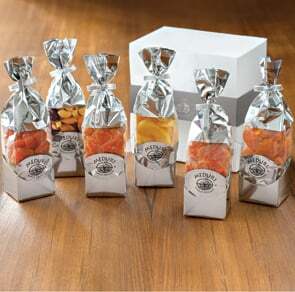 Each pretty silver bag contains 6 oz. of Meduri unsulphured dried fruit. Also available beautifully gift-boxed. 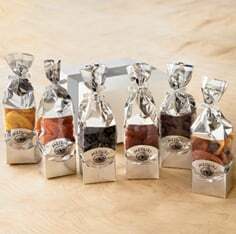 Meduri Favorites Six-Sampler Set Includes: Delicious Harvest Pride® Peaches, Mandarin Orange Slices, Sweetglow® Apricots, Cinnamon Fuji Apple Wedges, Double Red Grapefruit Slices, and our exclusive Meduri Trail Mix. 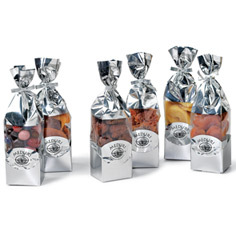 Find the perfect dried fruit sampler sets today at Meduri World Delights!